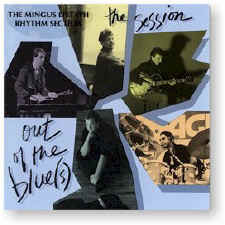 Straight from the highly-acclaimed Charles Mingus Epitaph recording on Columbia and a world tour, this group of regulars on the New York City jazz scene has gathered once again, this time to produce Out of the Blue(s) — The Session. What results are highly unusual, hornless, two bass, free wheeling explorations of a rich blend of standards (“Sophisticated Lady,” “Move,” “Moondreams”) and originals (Mike Formanek’s “Yahoo Justice,” Joe Locke’s “Tinderbox,” Jack Wilkins’ “Funny Blues,” Ed Schuller’s “Clave for Collin”). Recorded at the sonically vibrant American Academy and Instute of Arts and Letters in New York City. Recorded on 3 January 1992 at the American Academy and Institute of Arts and Letters in New York City, New York.